I can believe that it is the Body of Christ, I just can’t believe that it’s bread. In my last article I shed some light on the origins of the chalice. We will now take a closer look at the paten, especially since these two items go together as much as the bread and wine that fill them. Like its partner in grace the chalice, the paten has enjoyed a colourful liturgical past. 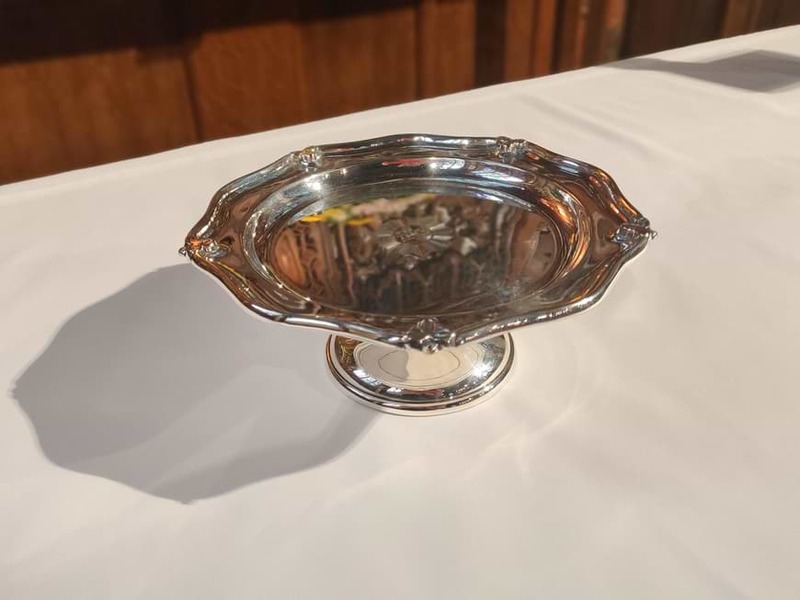 The word itself (pronounced with a short a, despite the word’s single consonant) hails from the Latin term “patina,” meaning “serving plate” or “dish” and refers to the repository which cradles the bread of Christ’s body that is offered in the Eucharist. As one might expect, the paten has gone through as many transformations as its sacred sibling, the chalice. Any informed church historian will tell you that the bread which Jesus broke with his disciples in the upper room certainly did not rest on the paten with which we are familiar. In all likelihood, that first paten was nothing more than a simple ceramic dish or wooden basket. In any event, in order to accommodate the quantities of bread that were needed to feed the faithful, a larger receptacle for the bread was needed. Some scholars suggest that the earliest patens were serving plates of generous proportions; glass, wood, or copper plates that tipped the scales at a whopping 20-30 pounds. Other pundits of eucharistic lore insist that the paten was neither plate, nor dish, nor even bread box. Rather, white linen bags – they insist – were used to distribute the consecrated bread. Not surprisingly the latter custom was quickly canned and the paten developed along its present plate-like lines. However, by the ninth century, when frequent reception of Holy Communion declined, it was no longer necessary to have patens of such considerable diameter. The large loaf of bread gave way to the small priest’s host that graces the paten to this day, making the paten similar in size to the one on which Jesus offered his body. Today it retains the diminutive dimensions that it took in the mediaeval church. The contemporary paten is approximately 15-20 cm in diameter – and is typically crafted in silver or gold – often matching the precious metal of the chalice that accompanies it. It is interesting to note, however, that in many churches, the practice of using real bread is gaining acceptance. Some would say that this return to ancient custom is yet another of the church’s ongoing attempts to recover the faith and witness of those first disciples, who gathered around the table to receive the (actual) bread of life from the hands of God’s very self. And yet, as with all things sacramental, what is important is not so much the elements themselves, but what they become; for, whether it’s a loaf or a wafer, we believe that what we have been given is nothing less than the Bread of Life.